Kenny Scott tells his younger brother to follow his heart when he picks a college. James Scott spent a portion of his summer in Atlanta visiting his brother Kenny, who is a standout cornerback for Georgia Tech. 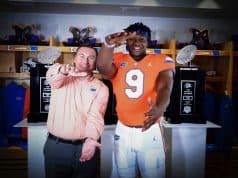 Even though the visit meant James had to miss Friday Night Lights at the University of Florida the visit was worthwhile because he got plenty of excellent advice from his older brother. “I’ve been out of town most of the summer,” said Scott, a 5-10, 165 pound cornerback from Daytona Beach Seabreeze. “I just got back in town last week. I’ve been up in Atlanta with my brother for about three weeks. It seems his friends and people surrounding Scott want him to go to the University of Florida. Scott will most definitely take his time and feel out the best fit for himself. Right now five schools comprise his current favorite’s list and two stand out. Scott went on to talk about each of the schools. Right now it is all about the team for Scott. He knows what he has to do and is expecting a lot from his inexperienced teammates. “I’m just expecting to make more plays than I did last year,” he said. “I want to be a dependent leader of the team. It’s something I grew up knowing how to do. His family has been through it once with older brother Kenny. James Scott knows that they will guide him along, but let him make the decision he wants to make. Scott plans on having an ultimate decision by some time in October. “They’re just kind of letting me do my own thing,” he said. “Wherever it feels home to me, that’s where I’m going to go. 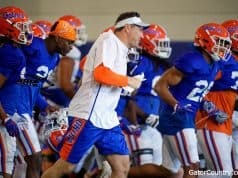 The Gators missed out on Kenny Scott with the previous coaching staff. 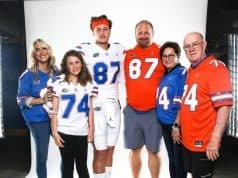 The Florida staff is trying very hard to make sure the Gators don’t go 0-2 with the Scott family.